Center for Heroic Leadership – Free change leadership training featuring videos, downloads and worksheets. 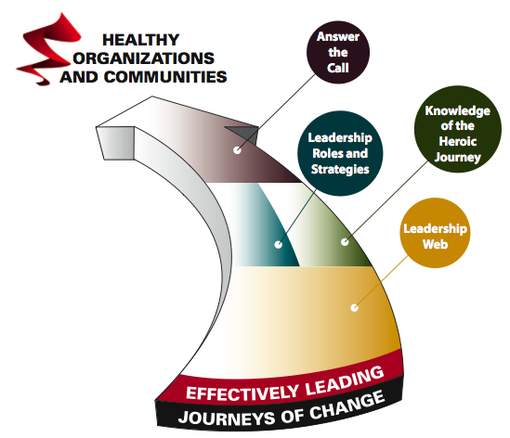 If you are committed to leading the journeys of change required for the health of your organizations and communities, then this site is for you. Our mission is to challenge and support you in bringing your best to whatever leadership challenges you face. We focus on the heroic journey because it is the story used by most cultures throughout time to teach their members how to create or renew a life, an organization or a community. It's really built into our "leadership DNA." You will find that this is a leadership story that you already intuitively know and one that can provide extraordinary guidance in leading journeys of change - in any setting. The Site is Free. You can download the book, QuickStart packets for implementation, articles and case studies at no cost. Our intent is to support as many people as possible at as low a cost as possible. The on-line book, Leading the Heroic Journey: The Wisdom of Cultures Throughout Time, presents four critical success factors that combine to provide the leadership required for successful journeys of change. Each chapter has a short overview video as well as a QuickStart packet to guide effective implementation. Heroic leadership is not about larger than life figures or grand deeds, but about commitment, wisdom, and disciplined action taken with others. The path is known. How do I begin working with my leadership team? How does this compare to other models for leading change? As a CEO what's my role and how extensive is it? Start with any Chapter. They all have video overviews as well as printed summaries and can be reviewed in any order. You can also jump right in by using any of the QuickStart implementation packets with your team. Just choose the most useful guiding questions and worksheets from each QuickStart packet. Start With the Position You Hold. You can begin by checking out how the leadership roles and strategies look from your position, particularly in larger organizations. The wisdom of the heroic journey can be adapted to any change and it will guide you from the beginning of the journey all the way through to the end. Explore the book and discover how easily you can apply heroic leadership to your life. If you want to jump right in and see how each of the four sources of leadership power might give you an immediate advantage, simply go directly to the QuickStart packets for each chapter. Each has guiding questions, templates and worksheets for leadership teams to use in implementation. For example, the QuickStart for Leadership Roles and Strategies is a favorite. A leadership team can simply follow the guiding questions to construct a comprehensive leadership plan for their journey.